I ecoprint on both fabric and leather and the results are unique. 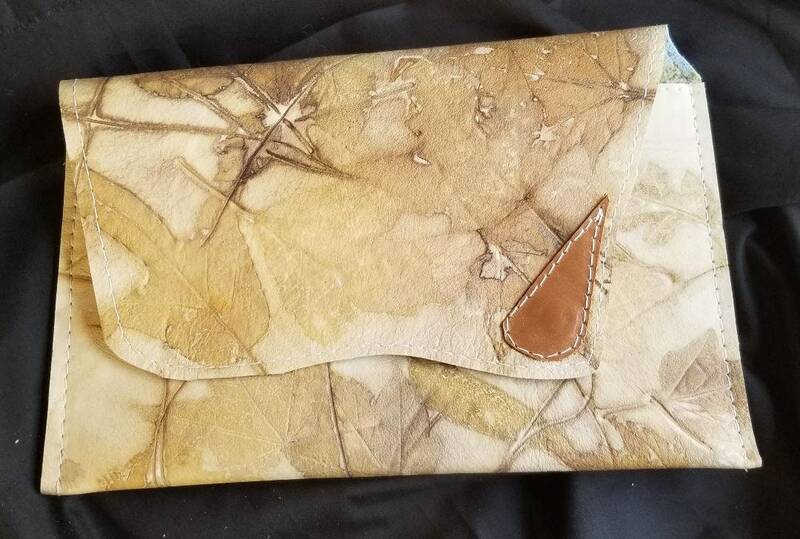 I first collect various leaves and foliage from my NC farm and through a natural process, imprint them onto leather. I handcraft the hides into handbags, journals, shoes and clothing. (watch for more!) The colors you see are the actual colors Nature released to me that day as I imprinted my pieces and the beautiful blue on the inside is from indigo. This unique handbag showcases my ecoprinted design. The leather bag itself is 8" high x 11" wide and has a magnetic snap enclosure. The external leather is Nature's design from the day I worked the leather. The inside is also ecoprinted but in a paler indigo blue. Fits your average 9.4 x 6.6 ipad which would simply slip into the enclosure and close with the magnetic snap. A unique ecofriendly, sustainable leather bag that speaks directly to lovers of Nature! This piece is not "just" another leather ipad bag (or clutch) but a leather bag with a design not found on leather sites anywhere! 🙂 Renewable and sustainable.